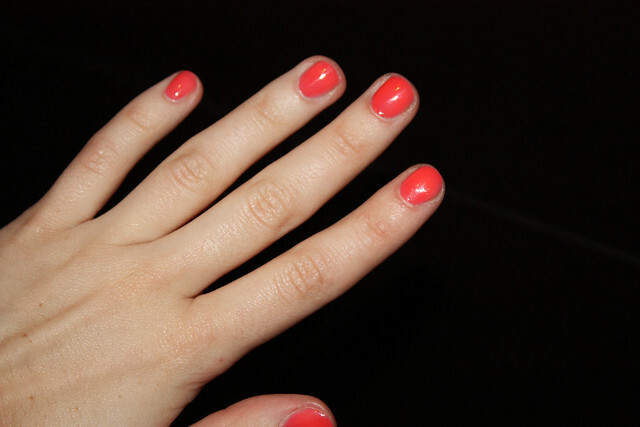 After much debating (and blogging about it in previous posts) I've finally purchased my saught-after coral nail polish for this summer! This means that I am now at 3 nail polish purchases out of the 5 I am allowing myself this year. So as I was sulking around in Neiman Marcus, the beautiful Deborah Lippmann nailpolish display caught my eye, and I was hooked! Deborah Lippmann "Girls Just Wanna Have Fun"
These nailpolishes retail for $16 a bottle and I can't speak of the quality of all of them but I am very happy with my purchase. It is a smooth, jelly-like consistency (similar to the consistency of Essie's Lollipop, which is one of my all time favourite nail polishes in terms of colour AND application) and it goes opaque in two coats. The brush is very similar to the brush of Essie nail polishes, which I prefer (I'm not a fan of the thick OPI brushes or the Chanel brushes that are a bit too "tall" and flimsy). I know it's not a terrible unique colour and it most likely has cheaper dupes out there, but I figured if I'm only allowing myself 5 nail polishes this year, I might as well make them special. 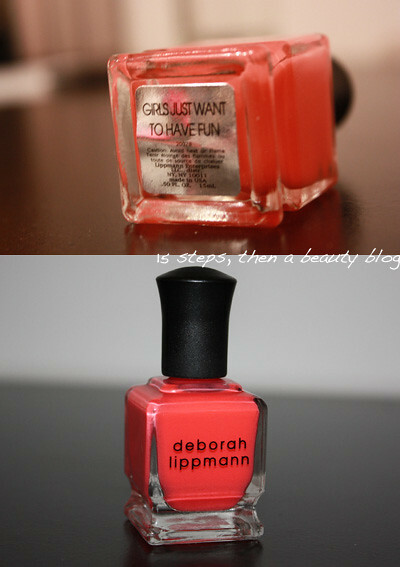 Do you own any Deborah Lippmann nailpolishes? Are you tempted to try?